I don’t know why – but to my ear everything sounds better in Swedish. Even though English is definitely my stronger language – the sound of spoken Swedish is one of the best things I know – especially if it is coming from a Skåning (someone from the south). I even prefer to read in Swedish as there is something so poetic in the way Swedish authors put their words to paper and the rhythm that they create that I don’t seem find in the English language. What I hate however is writing in Swedish…an absolute nightmare! Which is why you will never see a post in Swedish, or the fact that I only write emails and texts in English to my Swedish friends (something they find quite amusing)! So getting back to my post – I originally made these bad boys to go with my new low carb high fat (LCHF) lifestyle that I have embarked on the last 3.5 weeks. I was going to post it in my other blog LCHF…What?! – but thought that these are soo good and so simple to make that everyone will enjoy them. 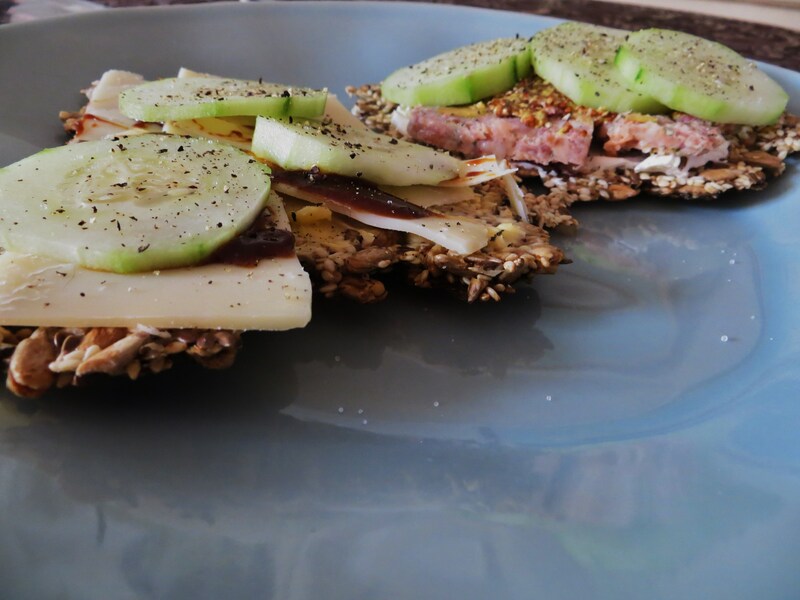 I originally got the recipe from a Swedish blog called Vardags Liv Med LCHF (everyday life with LCHF), which has given me so much inspiration for different LCHF friendly meals – and I can honestly say these crackers have become a life saver! I use them instead of bread and put lots of lovely toppings on like ham and cheese, pate etc etc. but I can also see how you can doctor them up by adding some herbs and salt to make it slightly more exciting. Blend all the above ingredients in a bowl, and let stand for 10 minutes (the seeds and psyllium husks will absorb all the water giving it a thick texture). On 2 baking trays with baking sheets, spread the mixture as thinly as you can, use a spatula or back of a spoon to help even it out. You don’t want there to be any holes. Place your baking trays in the oven for 60 – 70 minutes, or however long it needs for the mixture to get hard and crispy. Keep an eye out for burning. Break the bread up into desire size. I like mine to be slightly smaller than a piece of toast! Just to give some perspective on how they look flat! < Previous Dark Chocolate Brownies! 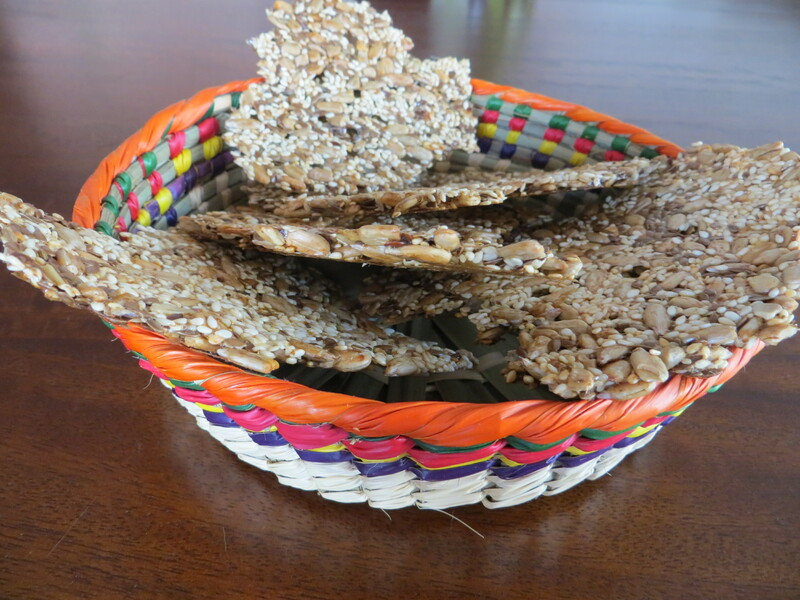 Pingback: Seed Cracker Recipe | LCHF...What? Marmite and banana slices is yummy too. Yep, I’m English too. My husband eats low-carb, and I’m always trying to find new recipes that will give him the crunch that he misses from crackers, breads, chips, etc. These look and sound delicious – will have to try! Absolutely love these crackers, make them constantly and love changing the spices and seeds so they’re always different. Definitely better cooked on silicone baking sheets – I had a disaster the first attempt with parchment paper! Thank you so much for sharing this excellent recipe! Very nice post. I simply stumbled upon your blog and wanted to mention that I’ve truly loved browsing your blog posts. Do you use psyllium powder or whole husks? I only know it as medicine! Hi Esther – I use psyllium husks, I don’t think the powder will become gelatinous enough. Let me know how it goes! 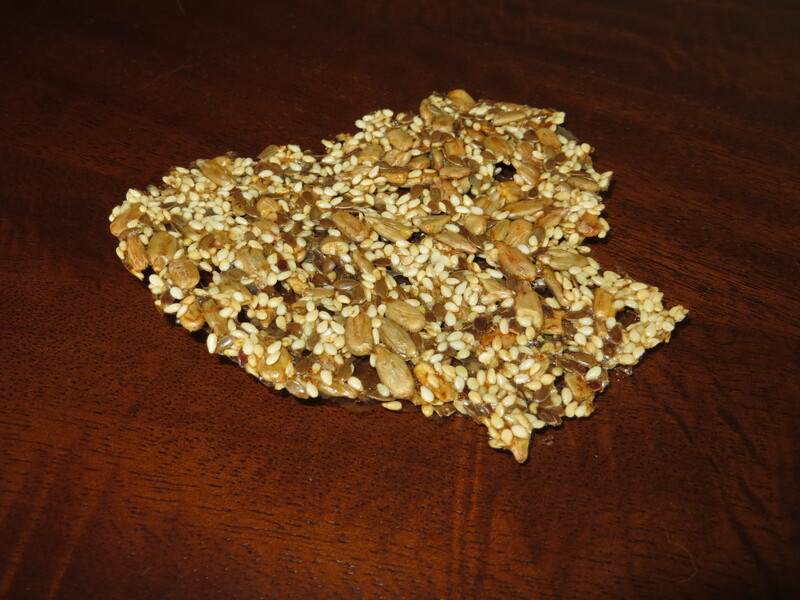 Can you buy “seed crackers”? Could you put chia seeds in these? Love them! Just made them tonight. Wondering what you think the carb content is? Thank you! Made my first batch of these last night, and they came out pretty well if I do say so myself! I substituted Chia Seeds for half the Sesame Seeds, and that’s worked just fine. In spreading the mixture in a pan I left it a little thick in the centre and thinner on the outside, so I’ll know better for next time (and will use 2 pans the same size so it’s easier to distribute the mixture between them). I’ve also started noting down some variants to try, like adding oregano, parmesan and some other herbs – for future batches! I cut them after they’d cooled a little using a pizza cutter and that worked a treat. Great recipe. You can cut them when about halfway through baking. Just return to oven to crisp them up. Great tip! thanks a lot Pearl, will give it a go! This sounds great but as we can’t get the nutrients from sesame seeds when whole, do you think substituting them with tahini would work? These are so good! Made them 3 x now in the past few weeks. I used psyllium husk powder and they turned out great!! Sooo crunchy and delicious with brie cheese and salami or just butter. I made these today. I have to admit I was dubious as I put them in the oven. However, they turned out brilliantly. They are crisp and delicious. Only thing I would add next time is sprinkle sea salt on them before baking. Deelish! I’m so glad that they turned out brilliantly! And I completely agree with you, a sprinkle of salt IS delicious! You can also try other dried herbs!